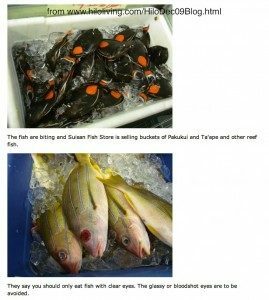 The marine aquarium fishery in Hawaii is but one of many fisheries. While it is a significant fishery, it is by no means the largest, nor does it have the greatest impact. Nonetheless, anti-aquarium fishery activists target only the aquarium fishery and blame it for reef devastation. The facts, as you will see below, do not support their position. Based on the data, we support all well-managed sustainable fisheries, including recreational fisheries, commercial food fisheries and aquarium fisheries. 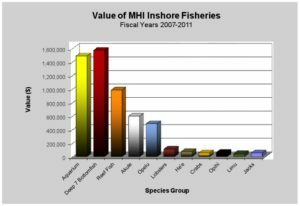 As can be seen in the graphic below (“Value of MHI Fisheries” “MHI”=Main Hawaiian Islands -ed. ), the aquarium fishery is one of the most significant inshore commercial fisheries statewide in terms of its value. For fiscal years 2007-2011, the only fishery more valuable was the deep seven bottomfish fishery. 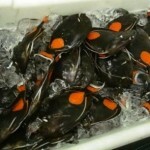 The deep seven bottomfish fishery includes `ula`ula koa`e or onaga (Etelis coruscans), `ula`ula or ehu (E. carbunculus), kalekale (Pristipomoides sieboldii), `opakapaka (P. filamentosus),`ukikiki or gindai (P. zonatus), hapu`u (Epinephelus quernus), and lehi (Aphareus rutilans). The largest marine aquarium fishery in the state is the aquarium fishery on the west or Kona coast of Big Island. Seventy-nine percent of all aquarium fishes caught in the State (FY 09-11) came from Big Island and 98 percent of these were from the Kona coast. In 2010, yellow tang (Zebrasoma flavescens) represented 81 percent of the Big Island aquarium catch. 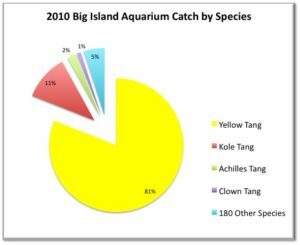 Kole tang represented 11 percent of the Big Island aquarium catch and Achilles tang represented two percent (see the graphic below). The anti-aquarium fishery activists argue the aquarium fishery statewide is “devastating” the reefs of Hawaii. While we acknowledge the aquarium fishery, like any fishery, has an impact, the marine aquarium fishery’s impact is certainly not the greatest fishery impact on Hawaii’s reefs. 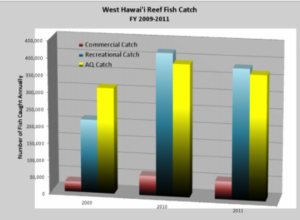 Consider, for example, that on Big Island–home to the largest aquarium fishery in Hawaii–the recreational reef fishery outpaced the aquarium fishery in 2010 and 2011 in terms of numbers of fishes caught (see “West Hawaii Reef Fish Catch” graphic below). While larger in terms of fishes caught, the recreational fishery is less studied and less regulated than the marine aquarium fishery…yet there is no push by the anti-aquarium fishery activists to ban or even further regulate the recreational fishery. When one looks at the aquarium fishery relative to both the commercial food fishery and recreational fishery on other islands which anti-aquarium fishery activists have targeted (e.g., Kauai), the aquarium fishery has virtually no impact relative to other fisheries. 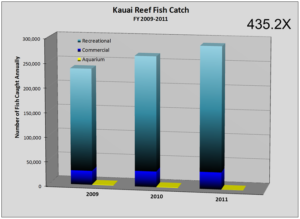 As shown in the graphic below (“Kauai Reef Fish Catch”), the other fisheries on Kauai are 435 times larger than the aquarium fishery…and yet it is the aquarium fishery that is targeted and blamed for reef devastation. Our intent here is not to suggest the recreational reef fishery be closed–as stated at the outset, we support all well-managed, sustainable fisheries. Our intent in posting these facts is to show how illogical the central arguments put forth by anti-aquarium fishery activists have become. If they are really concerned about reef devastation at the hands of aquarium fishers, than it follows they would also be concerned about fisheries that have an even greater impact. The reality is that all of these fisheries can be managed sustainably if fisheries managers have the authority and resources to manage. Our advice to the opposition? Look at the facts, and take a consistent approach to fisheries management. If you have questions or comments about anything posted here, please feel free to post them on the HawaiiBanFactCheck.org Facebook page at www.Facebook.com/HawaiiBanFactCheck. Fact: The anti-trade activists say the marine aquarium fishery is “devastating” the reefs. Fact: More reef fishes are taken by the recreational fishery than the aquarium fishery. Fact: The anti-trade activists promoting anti-aquarium fishery legislation are not promoting legislation to ban the recreational fishery. While we support sustainable food fisheries (recreational & commercial) in the same way we support sustainable aquarium fisheries, we don’t stand for illogical arguments that ignore the data.